Each will include bonus live performances, demos and rarities which will be included on the CD while an extra 45 will be included with the LPs with the extras. The six album included are from 1982 through 1990 after Lowe's initial success with the hit Cruel to Be Kind and his work with Rockpile. All were recorded for Columbia Records except for Party of One which came out on Reprise. 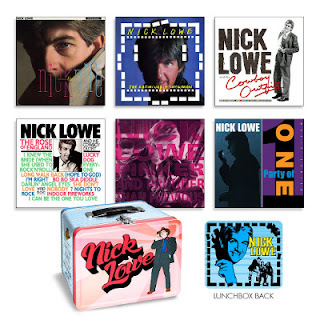 The box set, Lunch Box, is available now through Yep Roc Records. The individual albums will be released in three waves with Nick the Knife and The Abominal Showman out July 14, Cowboy Outfit and The Rose of England out August 25 and Pinker and Prouder Than Previous and Party of One on October 20.